Chat with your customers using the Messages app. Business Chat is a service that allows your organization to communicate directly with your customers using the Messages app. You can use the power of the Swift framework to define where your Business Chat buttons are displayed and set up your iOS and macOS entry points accordingly. 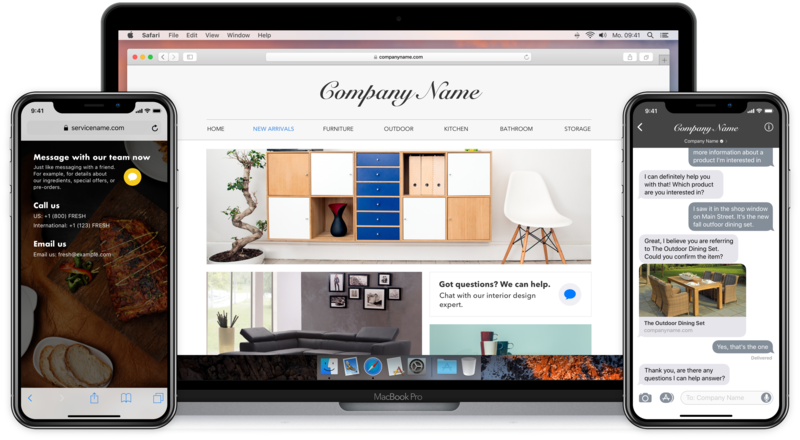 Depending on your configuration, customers can find your business and start a conversation from Siri, Safari, Search, Maps, your website, and iOS apps. Through Apple Business Register, you can create Business Chat Accounts (BCAs) or Customer Service Platform (CSP) accounts. BCAs are for businesses who want to communicate with their customers using Business Chat; CSP accounts are for messaging service providers that offer Business Chat as a service for other businesses. For more information about these accounts and how to qualify for them, see Business Chat Getting Started Guide. If you want to implement REST API solutions on your CSP, see Business Chat REST API. Apple devices running iOS 11.3 and later or macOS 10.13.4 and later support Business Chat. Register your business with Apple to start using Business Chat. Give Business Chat a try using Business Chat Sandbox and Messages. Let customers start a conversation with you from your app. Let customers start a conversation with you by adding a Business Chat button to your website. Let customers start a conversation with you from your website or email message. Allow customers to contact your business from Maps, Safari, Siri, and Spotlight searches. A Business Chat-branded button for use in your app.